Looking for something new to entertain your staff or customers after a long day of meetings or training? Try one of our theme parties! Your guests can participate in all types of sport themed activities: including; basketball, football, hockey, baseball, soccer, racing, darts, and more! We can make fresh popped popcorn on site and your guests can have some fun while mingling and building relationships with their counterparts. Who doesn’t enjoy the challenge of trying to win at one of our old fashioned carnival games? Adults love the chance to be a kid even for a couple of hours and our carnival night does just that. 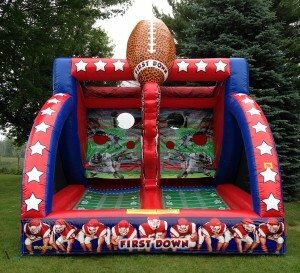 They can shoot darts, toss rings, throw bean bags, slide pucks, race pigs and more. Our delicious fluffy cotton candy will add an extra dimension to your event. 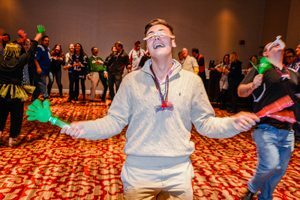 Your guests will utilize skills of creative thinking, concentration, and speed in these individual or team competitions. 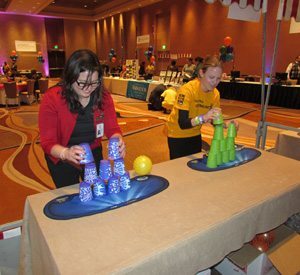 Your guests can compete in timed challenges like cup stacking, pick-up stix, don’t lose your marbles, chain reaction and many more. Score cards can be turned in and prizes awarded for individuals or teams! We have a lot more to offer including photo booths and game shows. Let us customize an event to suit your needs. We can help surprise your guests with a one of a kind event and make it easy for you too!